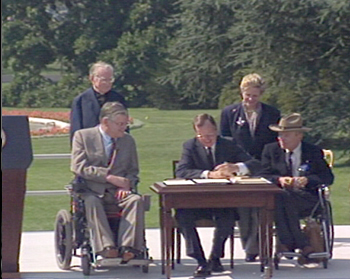 Advocating for the civil rights and equality of people with disabilities by influencing and implementing legislation and policy at the local, state and federal level. Advocacy means working on, supporting or recommending a particular cause or policy. Personal advocacy: an Individual acquires the knowledge and skills to solve his/her own problem, self-advocacy. Peer advocacy: Two or more individuals with common goals assist one another to achieve advocacy goals. Systems advocacy: The community works together to educate officials and influence legislation and policy at the local, state and federal level. Legal advocacy: Individuals or classes file formal complaints or seek court remedies with local, state or federal entities such as the Departments of Justice and Transportation or housing authorities for purposes of eliminating barriers to access, or when civil rights are being violated. The Americans with Disabilities Act (ADA) makes it possible for everyone with a disability to live a life of freedom and equality. Signed into law by the President of the United States on July 26, 1990 after passing with overwhelming bi-partisan Congressional support, the ADA was the first comprehensive declaration of equality for people with disabilities. The ADA protects the rights of people with disabilities in all aspects of employment, in accessing public services such as transportation, and guaranteeing access to private establishments (places of public accommodation) such as restaurants, stores, hotels and commercial buildings. Learn more about the ADA here.